Slept in a little bit, and then did some walking around Singapore in the morning. Frankly, in the heat and humidity, it really wasn’t that pleasant for walking around, so I headed to the mall at Bugis Junction to at least get a bit of air conditioned exercise in (and I won’t lie…I also wanted Starbucks so I killed two birds with one stone.) 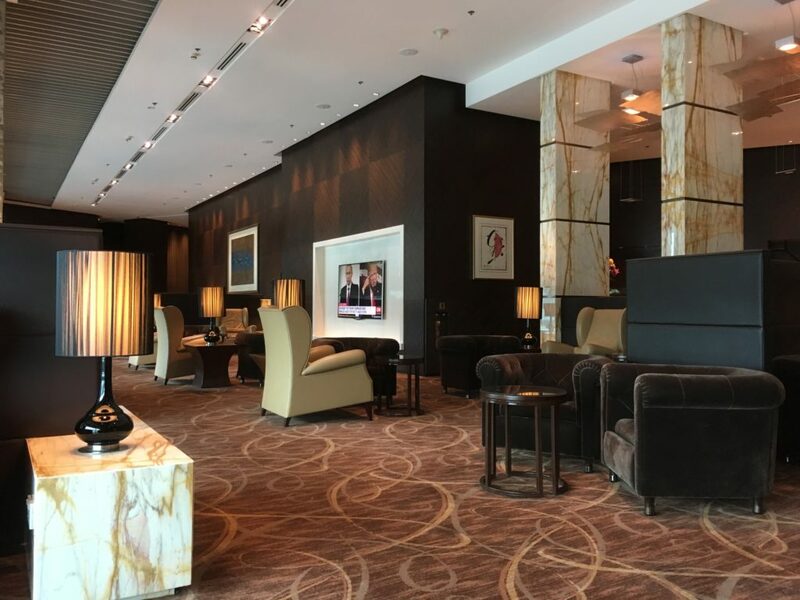 It was mid-day heat at this point, the time of day when no sane person from northern climes would be caught dead outdoors in Singapore, so I checked out of the Westin and made a hasty retreat to Changi Airport. Now, let’s be honest. Since I was flying in first I not only had the awesomeness that is Changi at my disposal, but the Private Room in the Singapore Airlines lounge as well. 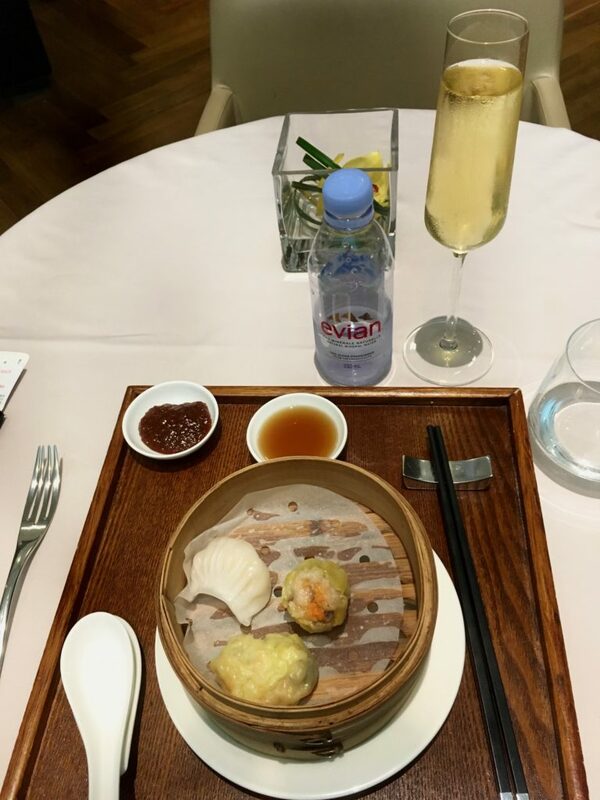 In my previous attempt six months earlier at enjoying Singapore A380 suites the one thing I did right was enjoy the Private Room. But, frankly, after a while a lounge is a lounge and it’s pretty easy to get bored in there. So, I didn’t want to get to the airport TOO early. Caught an Uber to Changi, piece of cake, and in case you’re unaware many passports can now leave Changi via automated gates so there’s not even a need to queue for passport control. 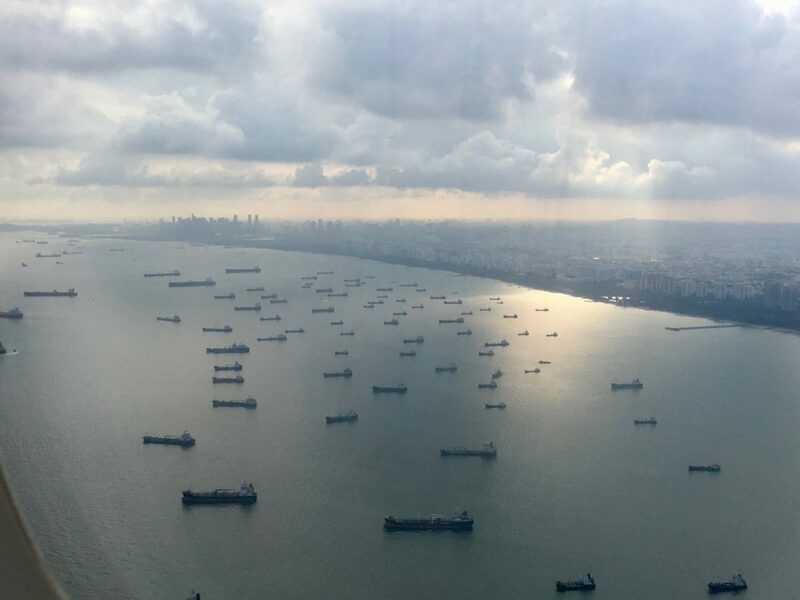 Biggest downside is that you also don’t get stamped out of Singapore…if that matters. It was early afternoon at this point, and I was getting pretty hungry, so I decided to stop by the Private Room first for a bit of lunch. 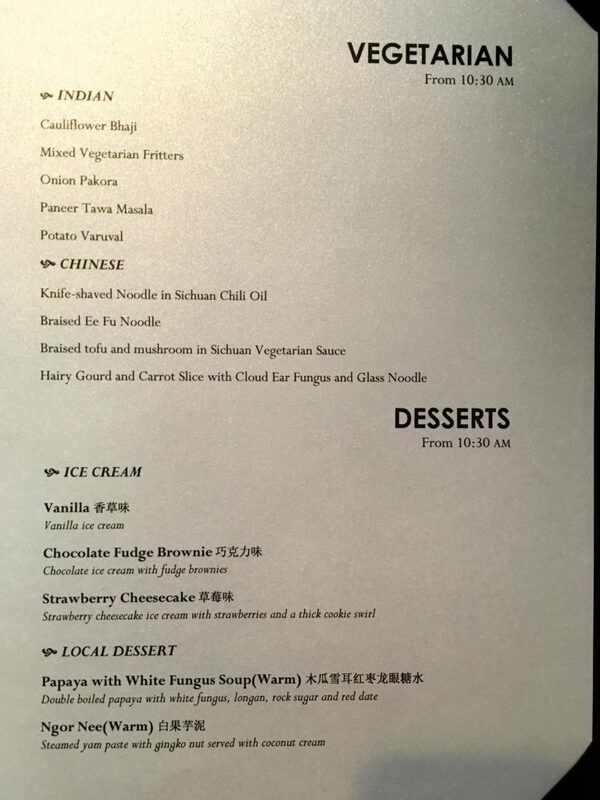 Today’s menu, notably absent was the lobster which they were serving in February.. 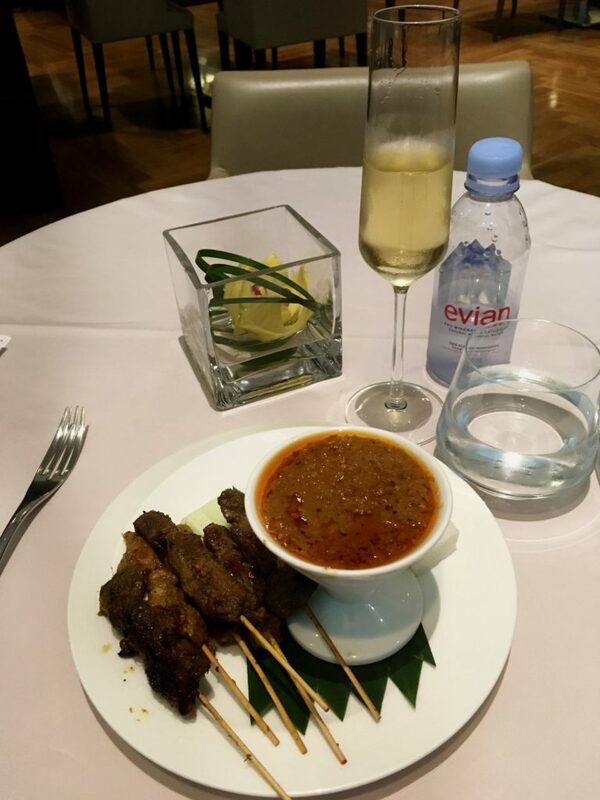 I figured I would go with the satay as a starter, which was absolutely delicious, with a glass of champagne. Singapore has really upped the champagne game since my previous visit, however, and they were now pouring 2002 Piper-Heidsieck Millésieme Cuvée Rare. 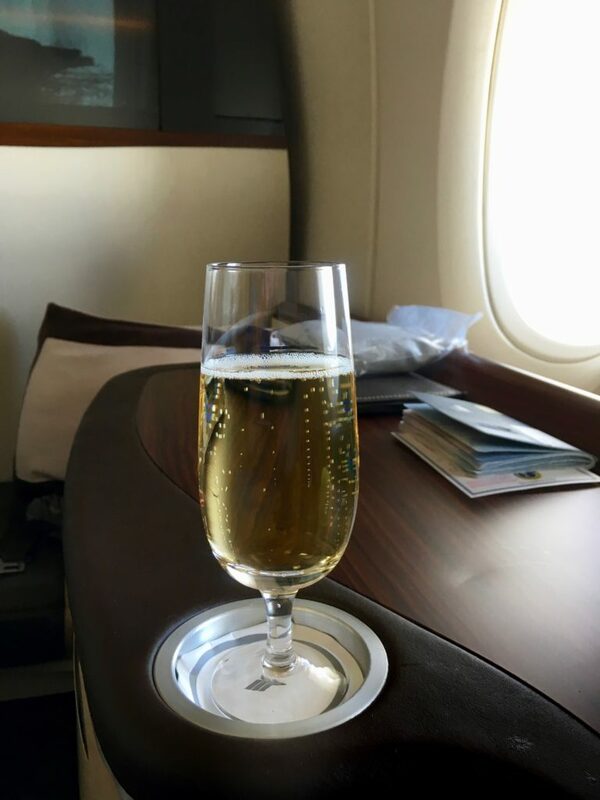 I know I’ve said it before here, but people have long associated Dom Perignon with luxury airline champagne, and Krug is also on that list. In the club scene (at least in the US) Cristal would also be a “bling” label…so it’s always nice to see a really high end champagne that’s different on offer. 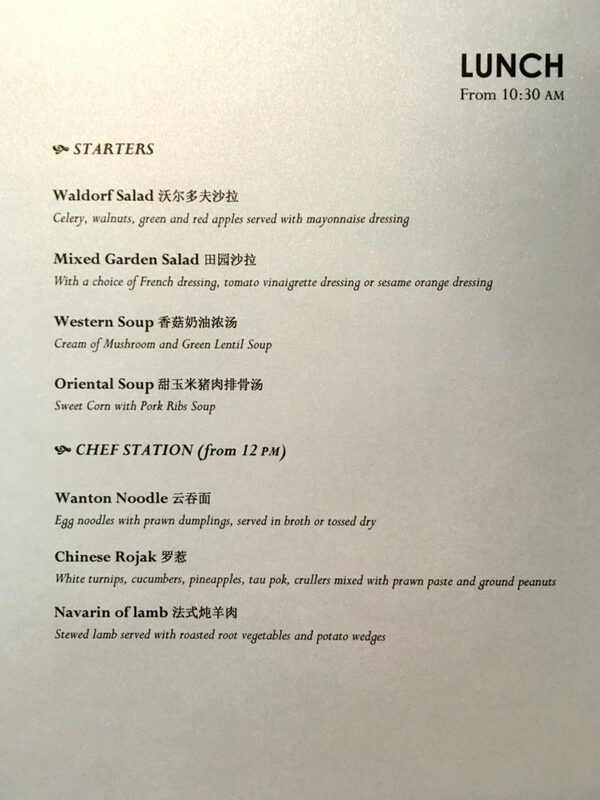 I was a little hungry still after the satay, so asked the attendant what was small, and was recommended the dim sum. 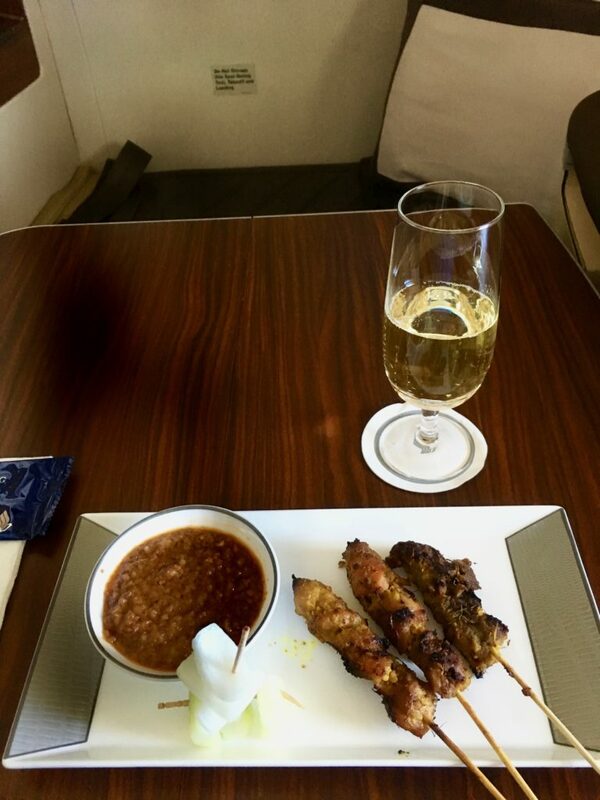 Perfect amount of food along with the satay, and a rather generous top up of the champagne. 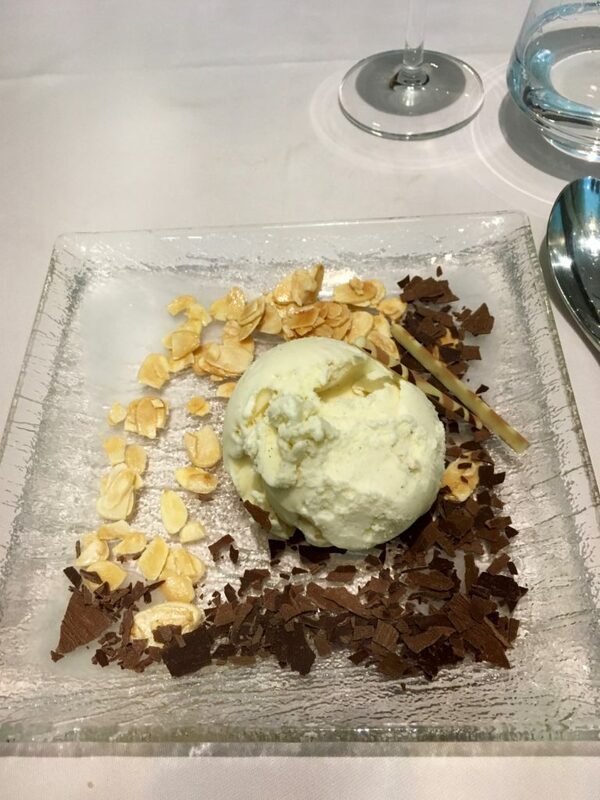 Unfortunately, they only had vanilla ice cream today, but that was just fine with some chocolate flakes and almonds as a dessert! Completely full on lunch, and with nearly four hours remaining until my flight, I decided to do a lap of the airport. The entire airport. Changi is shaped in a giant U shape with terminal one being the “bottom” of the U that connects terminal three (where the private room is) with terminal two. Fight thing I saw when I left the lounge was my plane, already parked next to the lounge, waiting to take me to Delhi in a few hours. 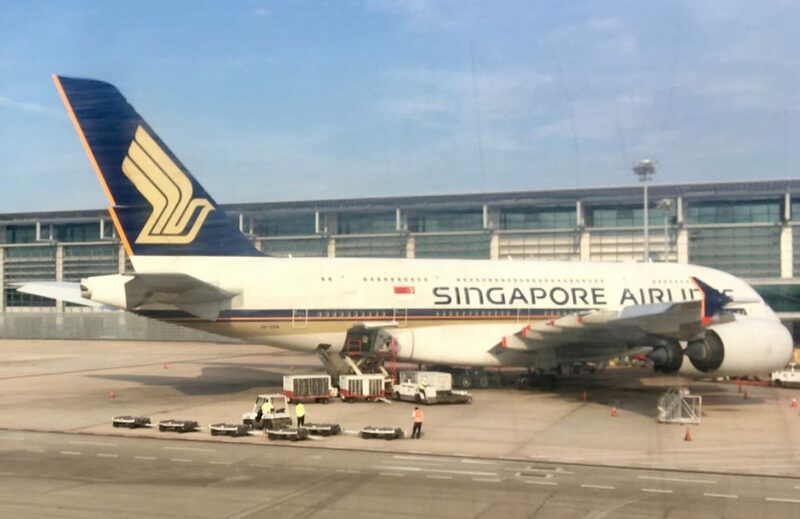 Coincidentally, it was the same A380 that had delivered me from Sydney the previous day! So, I walked all the way to the other end of terminal three, the entire length of terminal one, and then to terminal two where I decided I was getting sleepy…and wanted to enjoy the flight ahead…so I stopped for some Starbucks. The people watching in T2 was fascinating, given many budget airlines leave from this terminal. Walking past this gate, it wasn’t difficult to figure out where this flight was headed. 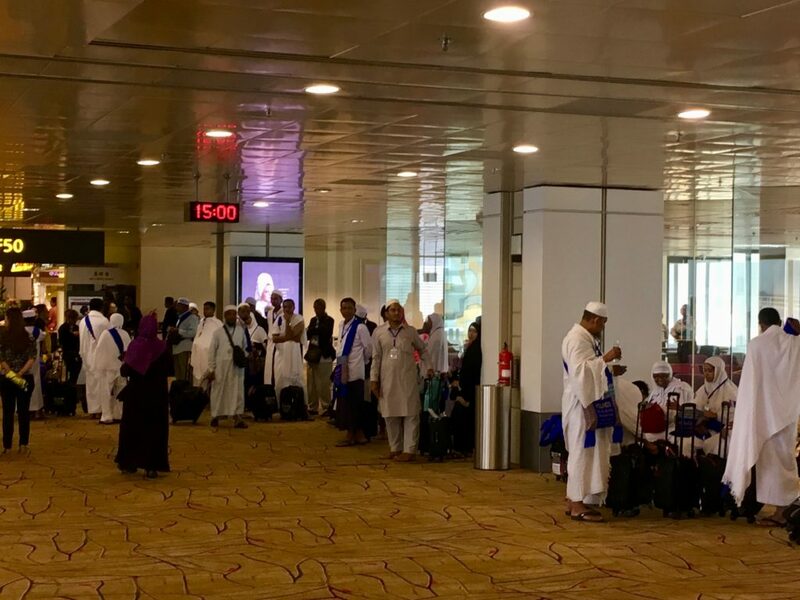 Given the attire of the passengers, many already in their Ihram dress, headed to Jeddah and on to Mecca. 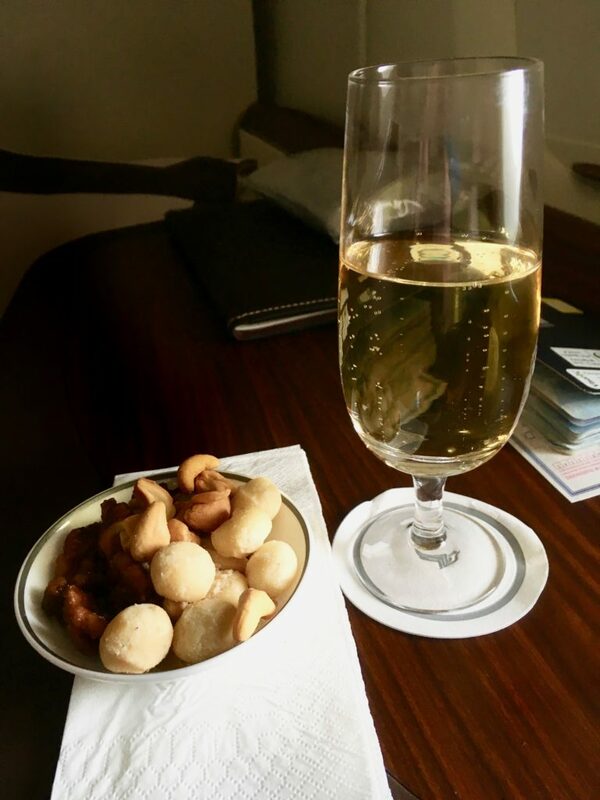 Enjoyed a shower (nothing luxurious at all about the shower facilities in the Private Room), a couple of glasses of champagne, and it was time to finally head down to the gate to enjoy my flight to Delhi. One note on the crew. Maybe it was the length of the segment, or maybe Delhi is a less desirable route than Sydney (maybe they do an immediate turnaround?) but there was something slightly less polished – and more fun – about this crew. When I say less-polished I mean it in a good way. 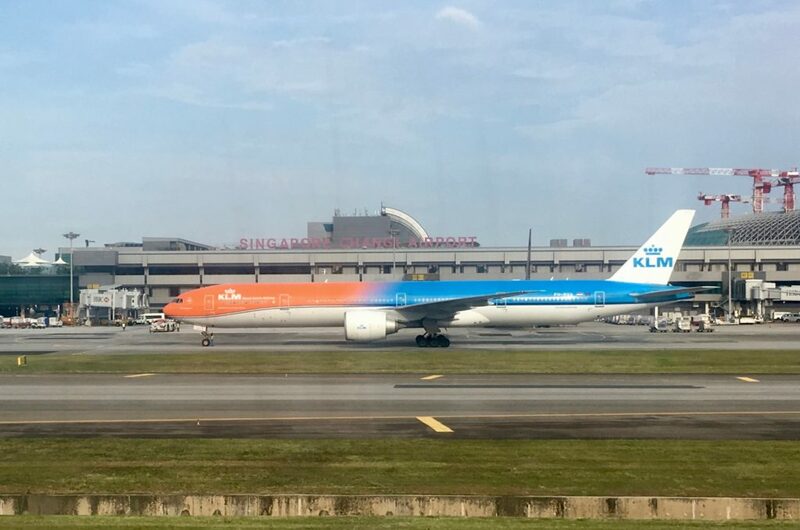 People often accuse Singapore crews of being “robotic” and while I have never really found that, this crew was very lighthearted in a way you very rarely see with crews of Asian airlines. There was just enough informality that I really enjoyed this crew. This was followed by more satay right after takeoff. I definitely got my fill of satay in these 24 hours! 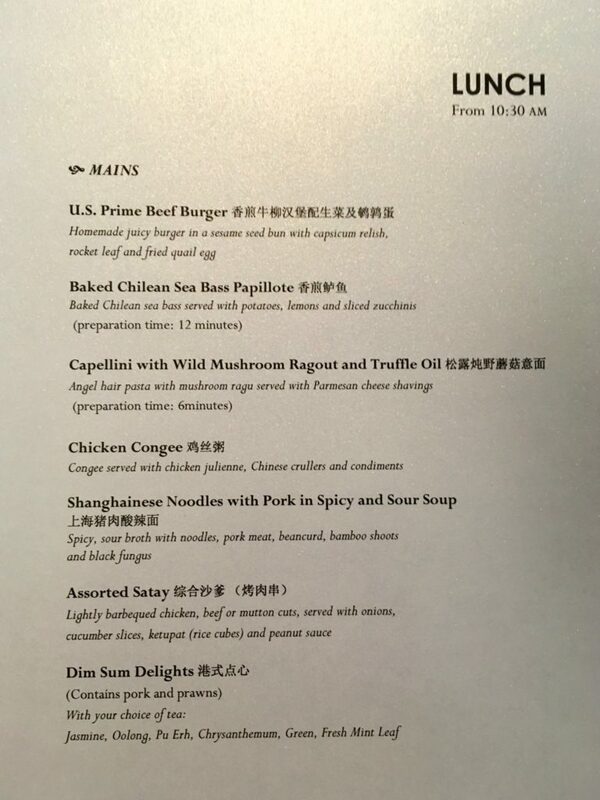 After the satay, the crew suggested they could begin the dinner service in a little over an hour. I’m sure they would have been happy to do it whenever I wanted, but truthfully I was still a little full from the lounge, so that sounded like a great idea. I enjoyed catching up on some tv on the iPad, and soon enough some nuts came around. The champagne was flowing the entire time. For a starter, “seared tuna on niçoise salad with quail egg” – this was absolutely delicious. 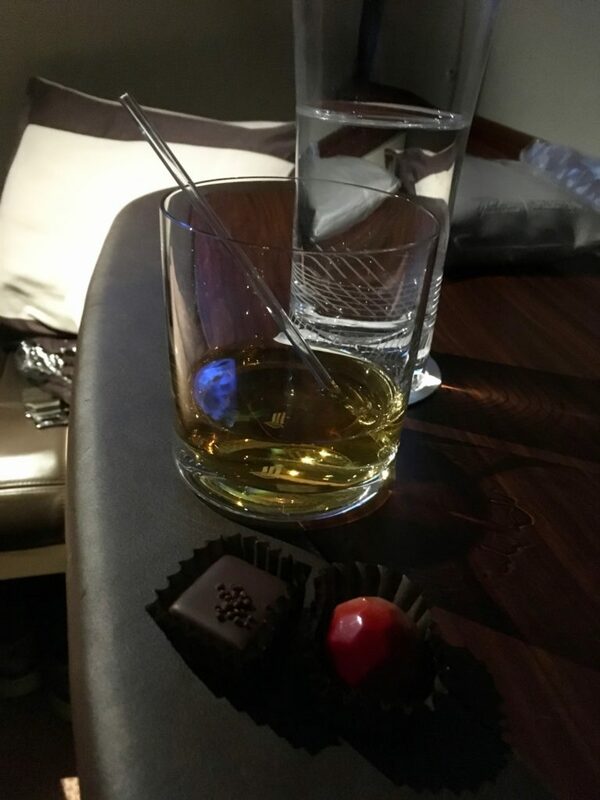 Note the water glass, we had quite a bit of turbulence. 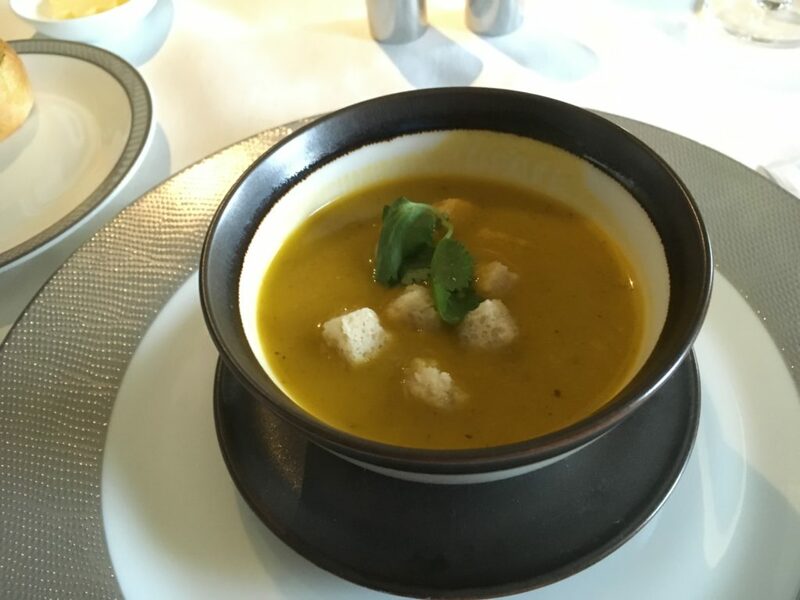 Indian style creamy carrot soup with coriander. Spicy, and delicious! 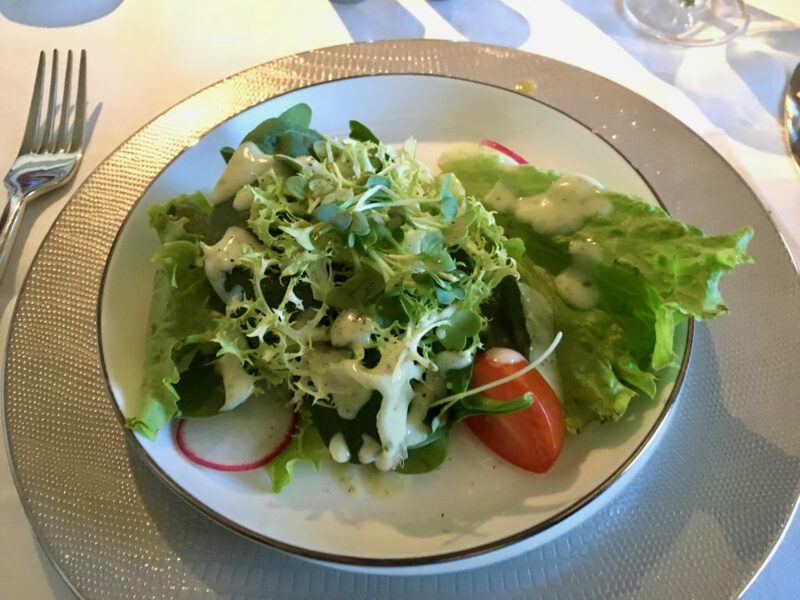 …and I quote: “Green coral lettuce, frisee, spinach, cherry tomato and red radish” – for such a fancy name, it was a pretty meh and blah salad overall. The Boston Lobster Thermidor. Frankly, the one out of Sydney was better. It was definitely delicious, and that big ripe tomato was amazing, and there was more lobster than out of Sydney, but it was just kind of bland and overcooked from a flavour point of view. 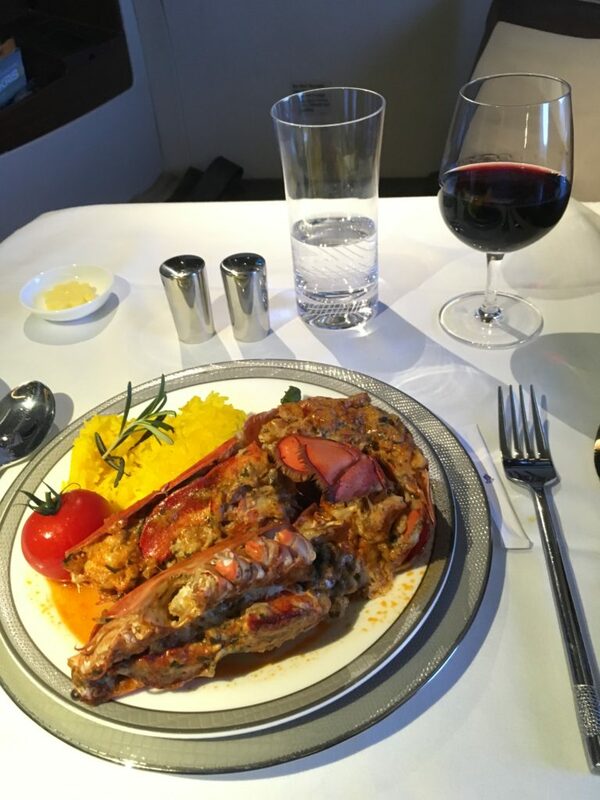 That said, it was still in-flight lobster so you have to like it! Who can say no to a cheeseboard like this?! This is pretty much my idea of Heaven. 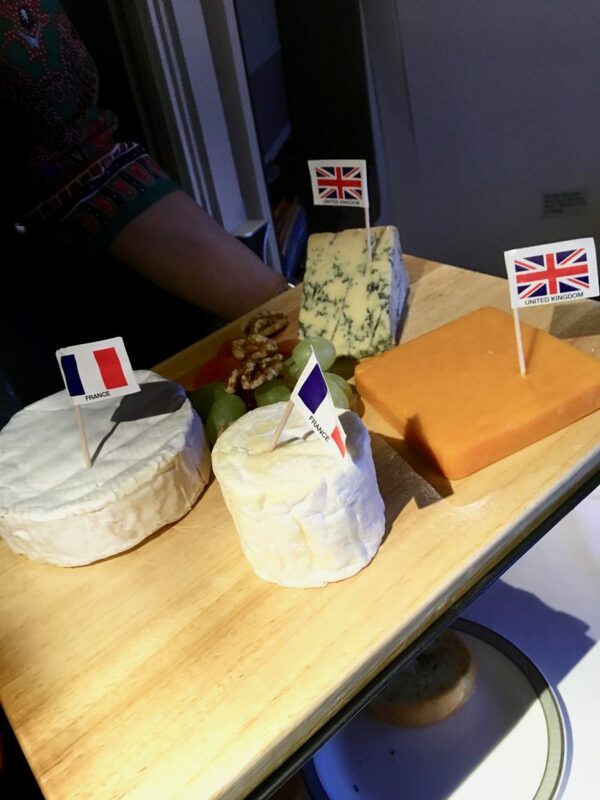 Lufthansa has some serious competition in the onboard cheese department! Why yes, I’ll have a nicely plated small amount of each. 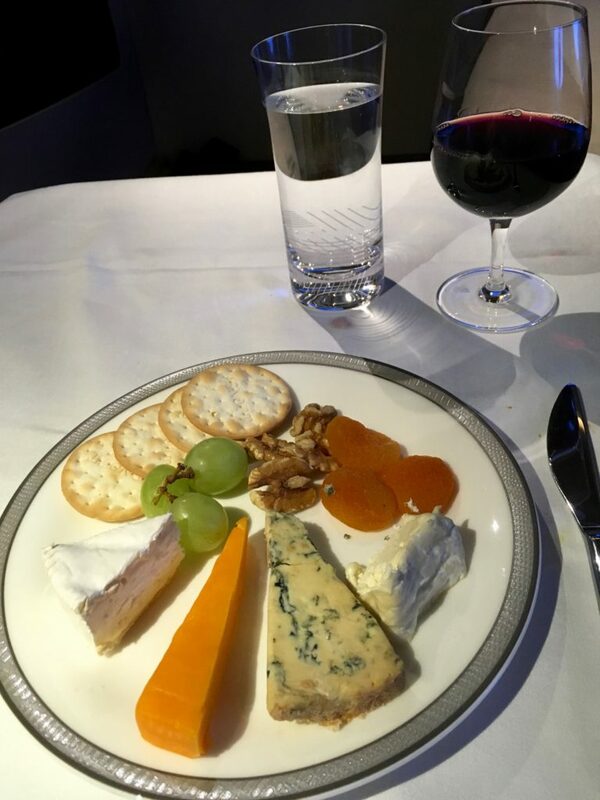 Should have asked for extra of the Stilton – it was delicious! 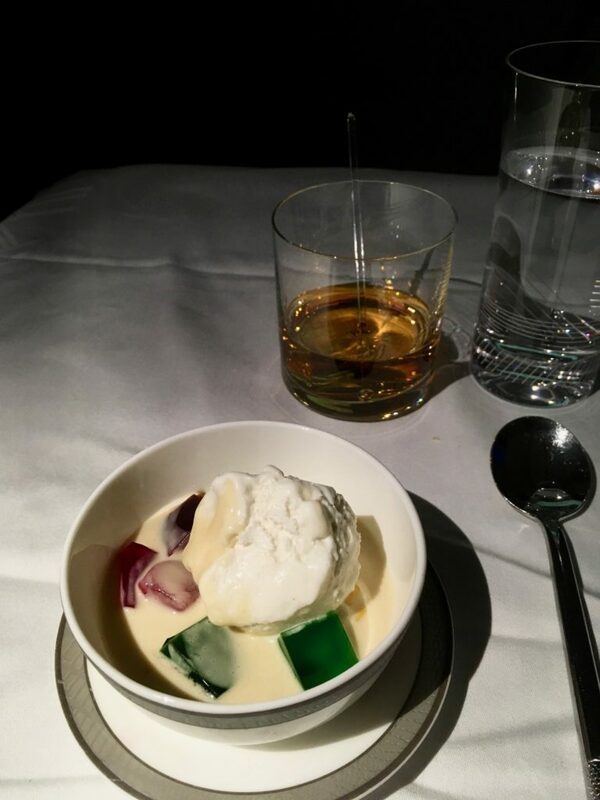 In fairness, I wasn’t overly excited by the dessert, which was listed as “chendol with coconut ice cream” but I think at the end of the meal it was definitely the best part. Absolutely delicious, and paired very nicely with a glass of Johnny Walker. After dinner pralines with my friend Johnny. 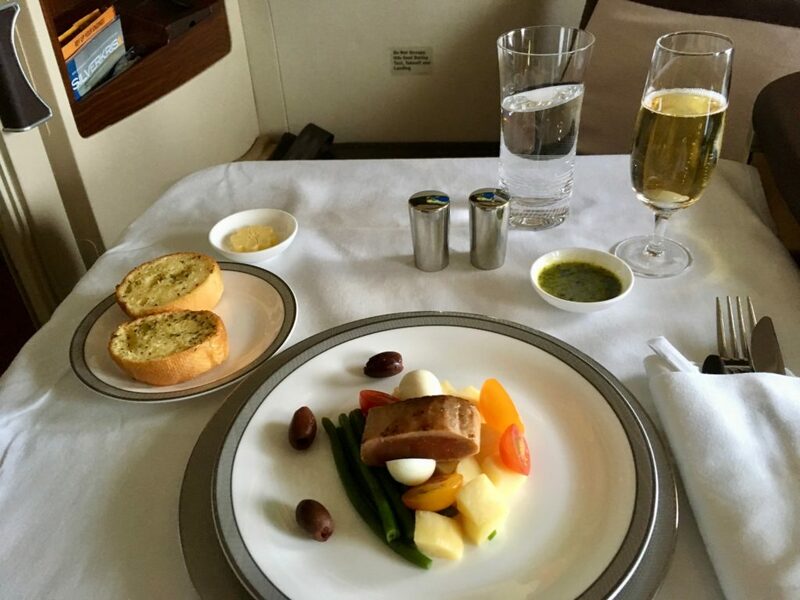 By the time the meal was over, we were barely an hour away from landing in Delhi. 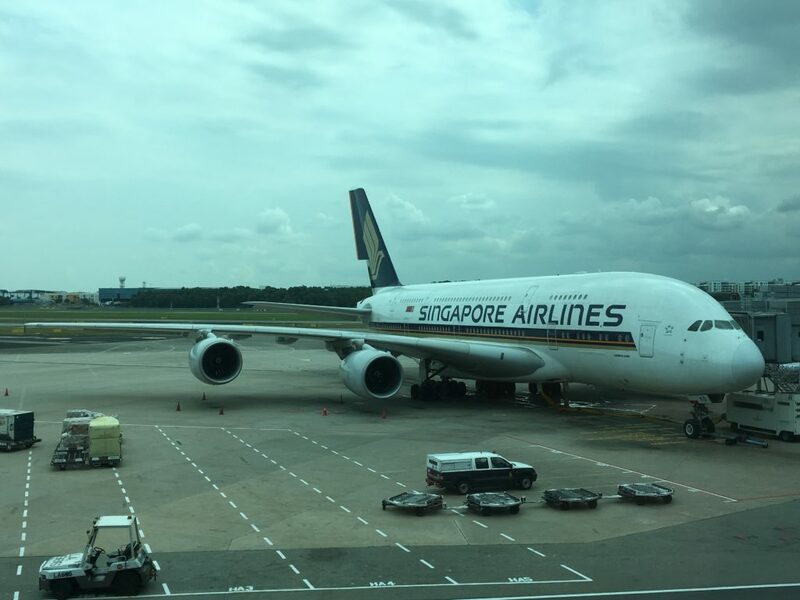 With that, all too soon, my two fantastic Singapore A380 suites experiences were over. It was a great experience, a fantastic way to travel, and I would love to do it again if the opportunity presents itself. However, I can finally check “flying it just for the fun of it” off my list, and get back to other products I’m still curious to try, as well as just flying the most comfortable product on the routes I do need to fly.